The latest in exoskeleton technology was demonstrated recently at an event showcasing its potential to improve the lives of sufferers of neurological and multiple trauma injuries. 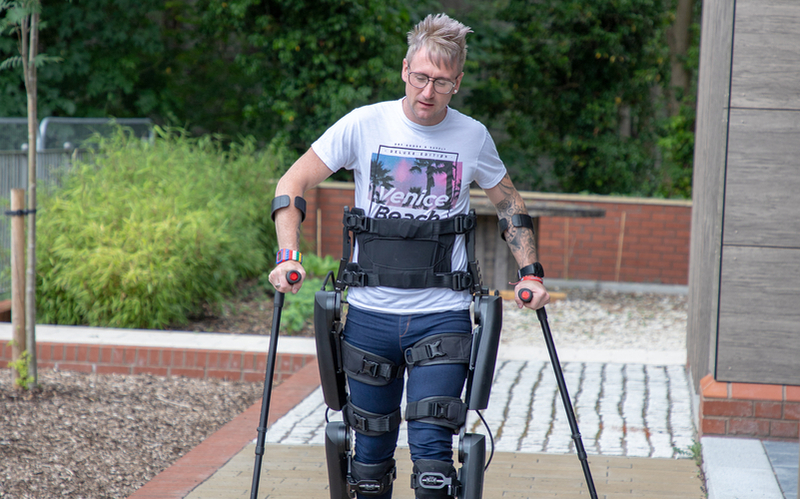 Hosted at STEPS Rehabilitation in Sheffield, in conjunction with law firm Stewarts, the event saw medical practitioners interested in using the technology to improve their patients’ recovery receive demonstrations of the REX, ReWalk 6.0 and Ekso GT. Simon Kindleyside and Dale Messenger took centre stage to demonstrate how they operated the exoskeletons and explained the positive impact that the suits have had on their lives. Kindleyside was diagnosed with an inoperable brain tumour in 2013 that left him paralysed from the waist down. Earlier this year, he became the first paralysed man to walk the London Marathon route. He demonstrated the REX and ReWalk.6 exoskeletons at the STEPS and Stewarts event.